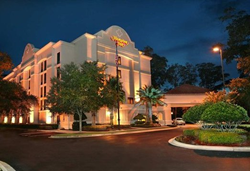 Leading hotel management company Naples Hotel Group has acquired the management contracts for two Jacksonville Florida hotels, Hampton Inn and Holiday Inn Express & Suites. The Naples Hotel Group, a leading hotel development and management company, announces they are now managing the Hampton Inn Jacksonville Ponte Vedra Beach and Holiday Inn Express & Suites Jacksonville SE Medical Center. The Florida hotels were purchased as a new venture with the ownership group Everett House Partners, LLC, and Naples Hotel Group as the management company. The hotels were brought into the Naples Hotel Group portfolio under the leadership of Andrew Bou-Sliman, Vice President of Acquisitions and Development, and Rich Cassara, Senior Vice President of Operations. The hotels are within a 5-mile proximity to each other with some of the best of Jacksonville, FL nearby. Notable nearby businesses and attractions include Mayo Clinic Campus, Jacksonville Beach, and TPC PGA Sawgrass. Naples Hotel Group will be charged with operations as well as overseeing property upgrades over the next 12-24 months. The new management contract reflects Naples Hotel Group’s recognized expertise in developing and operating premium branded products. Naples Hotel Group continues to grow in the Southeast United States with this acquisition. Naples Hotel Group is a hotel development and management company founded in 1999. NHG has achieved superior results and has a proven ability to enhance the performance of hotels using their experience, responsiveness and extensive resources. NHG, based in Naples and Orlando, prides itself on building long-term relationships with quality people and organizations. To learn more visit, http://www.napleshotelgroup.com.